So many samples! So much data! 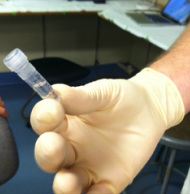 After ten days of research at sea on the cruise we brought back a ton of samples to analyze in the C-MORE labs. We measured nutrient concentrations, primary and bacterial production, chlorophyll a concentrations, ATP and particulate carbon, nitrogen and phosphorus. 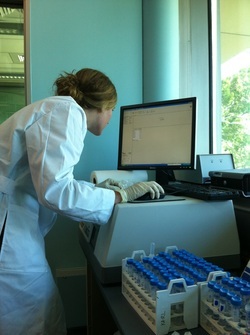 We spent the last week of the course running these samples in the lab and analyzing the data. We used these data along with data collected from the CTD, optical sensors and the genomic samples to make a 2 hour presentation on our findings. So much data! 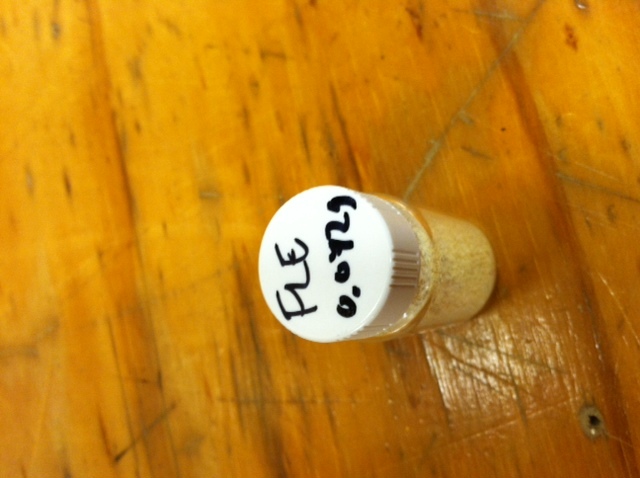 Primary productivity samples awaiting analysis on the liquid scintillation counter. 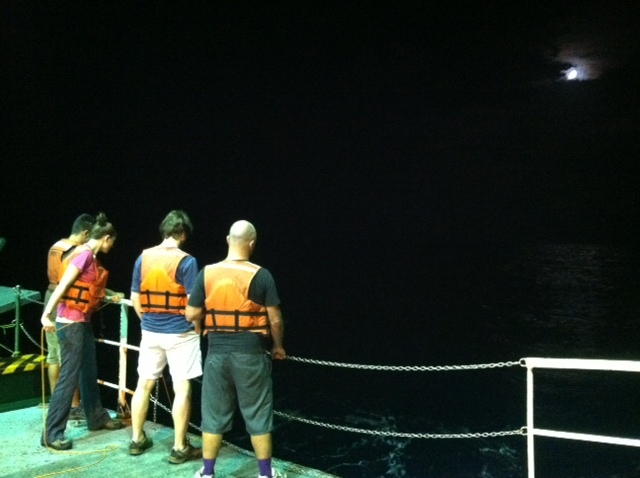 Net towing for plankton at 1am! 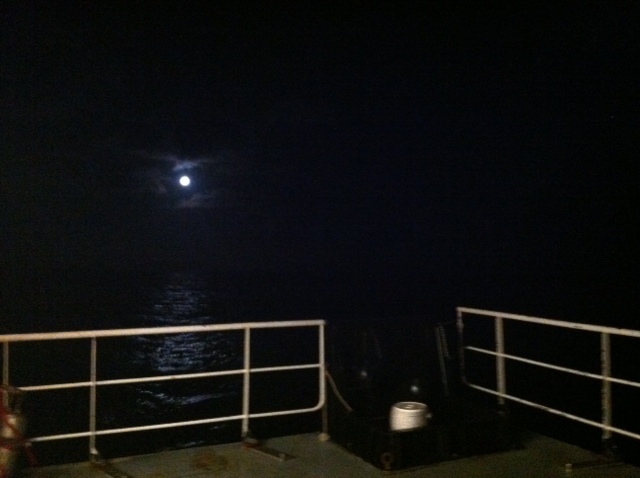 During the research cruise we made qualitative comparisons between the plankton community observed at night verses the community observed during the day. The most abundant forms of life at Station Aloha are those that cannot be seen by the naked eye. Bacteria, viruses, and most phytoplankton and zooplankton can only be seen using a microscope. 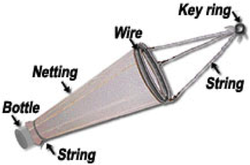 In order to view the plankton in the water you can use a funnel shaped net called a plankton net which is dragged or "towed" through the water. The net allows water and very small particles flow through but collects plankton that are bigger than the mesh size. The plankton are concentrated in a bottle attached to the bottom of the net. 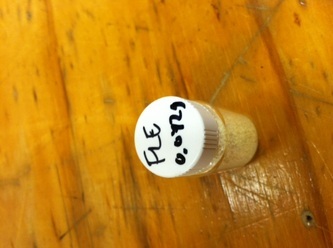 The contents of the bottle (lots of phyto and zoo plankton!) can then be viewed under a microscope. 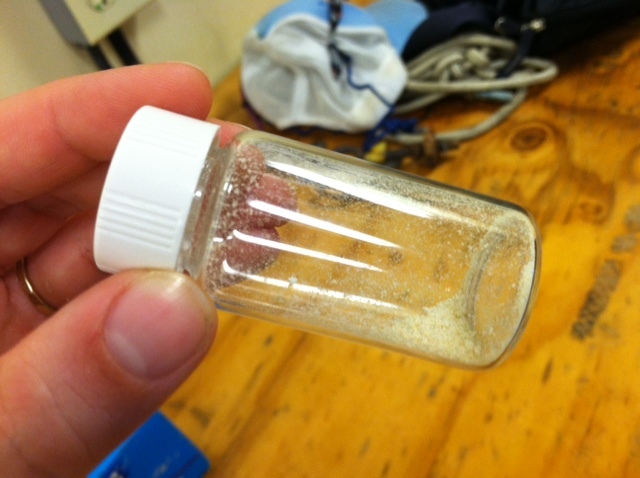 We saw pennate and centric diatoms, radiolaria, copepods and much more. Deep CTD cast on 6.19.2013. 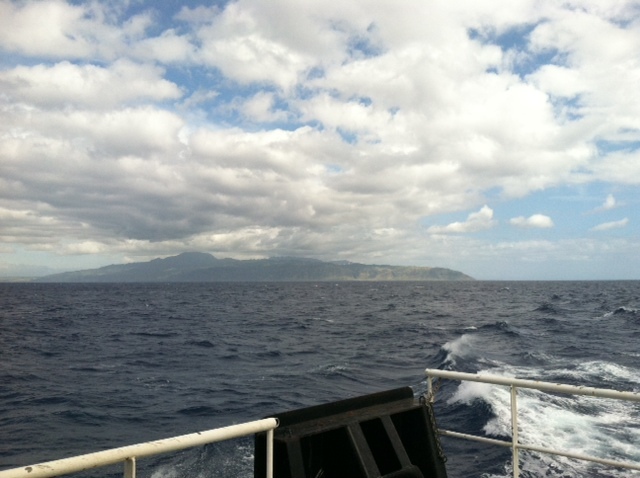 Station Aloha is approximately 4800 meters deep. 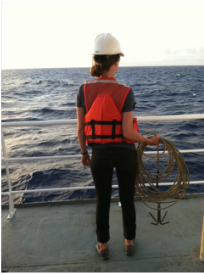 During the research cruise we took 2 CTD casts from the surface waters down to the very bottom. The deep ocean water is cold and salty making it very dense. At the surface the water is a balmy 25 degrees Celsius (77 degrees Fahrenheit) while at depth it is near freezing temperatures! The deep waters also have high oxygen because the deep ocean water comes from the cold, oxygen-rich deep waters from the poles. The water is transported by large ocean currents that connect all oceans. This is called thermohaline circulation. The movement of water is driven by density differences and is sometimes described as the "great ocean conveyer belt". Our decorated styrofoam cups after being sent down with the CTD. They were squished to about a quarter of their original size under the pressure of being 3 miles under the sea! 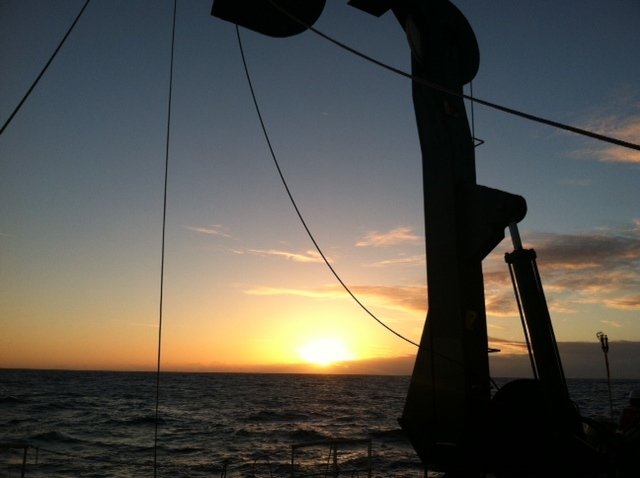 6.19.2013 Sunset from the stern of R/V Kilo Moana. 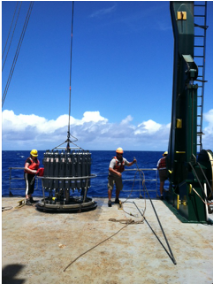 The A-frame is used to deploy instruments like the CTD and the experimental arrays for productivity. Prochlorococcus community circled in red. 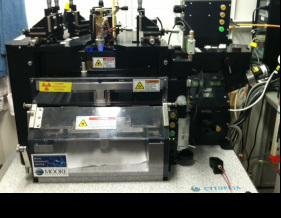 Flow cytometry is a laser based biophysical technology used for cell counting and sorting. It is used widely in the medical field to analyze blood samples but over the past few decades it has become an important instrument used in marine biology to determine microbial community structure and abundances. 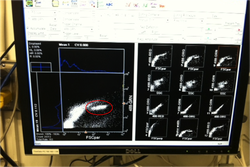 Flow cytometry suspends cells in a stream of fluid that then passes by an electronic detector. 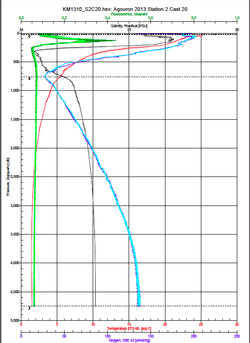 The analysis can characterize the physical and chemical attributes of up to thousands of particles per second. 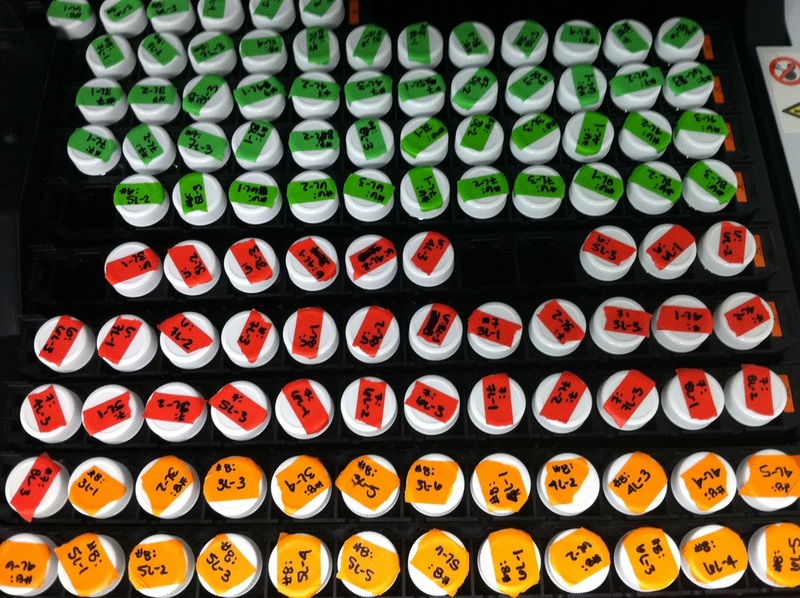 At Station Aloha and other low nutrient regions of the ocean, a genus of photosynthetic microorganisms called prochlorococcus are abundant and can be identified and quantified using flow cytometry (see picture). Prochlorococcus are incredibly small (0.6um) cyanobacteria that are the most abundant photosynthetic organisms on earth. One milliliter of seawater may contain up to 100,000 cells of these organisms. Due to their small size Prochlorococcus have a high surface to volume ratio which gives them a competitive advantage in low nutrient waters. They can also grow at very low light conditions. Despite their ecological importance they were not discovered until 1986 by Sallie W. (Penny) Chisholm (Massachusetts Institute of Technology) and other collaborators. 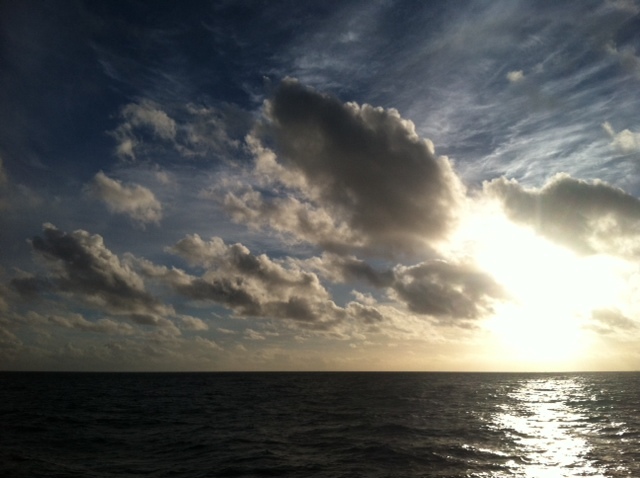 The discovery was made using flow cytometry methods in the Sargasso Sea. SQF getting ready to recover the array. Thursday was an awesome day! 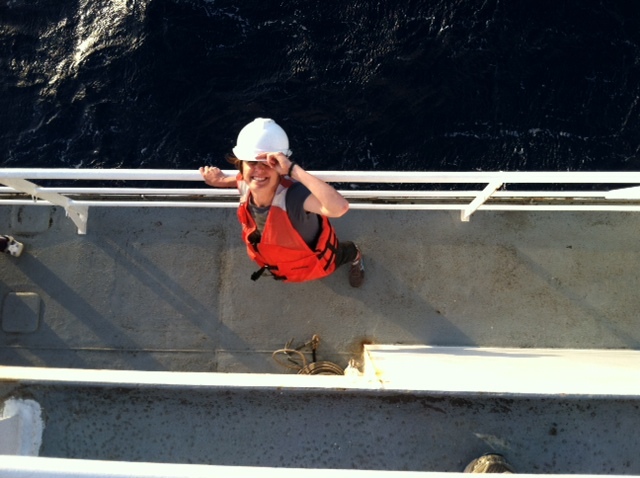 I love working on the deck. For the whole day our group was responsible for the deployment and recovery of everything put into the water. 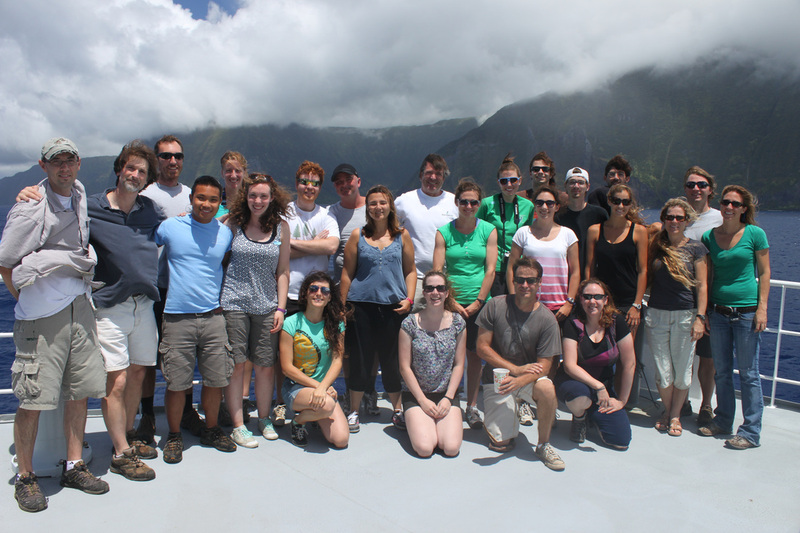 This included all of the CTD/niskin rosette casts, the productivity array, and optical instrument casts. The day started at 11:30pm (the night before)! Our first cast was at midnight and it included 3 different optical instruments plus a small CTD that were attached to the same metal cage. The optical instruments included a LISST (Laser In Situ Scattering Transmissometry), AC9, and ACplus. These are active optical instruments which means that they analyze the optical properties of the water using laser and light rays opposed to using light from the sun. This is why we can do the cast in the middle of the night. We also deployed a productivity array which contained bottles of sea water spiked with the radio isotope 14C and other bottles spiked with tritiated leucine (an amino acid with the radio isotope 3H). These bottles were placed on a line at different depths and then put into the water at sunrise and then floated around attached to buoys and an Argos transmitter. 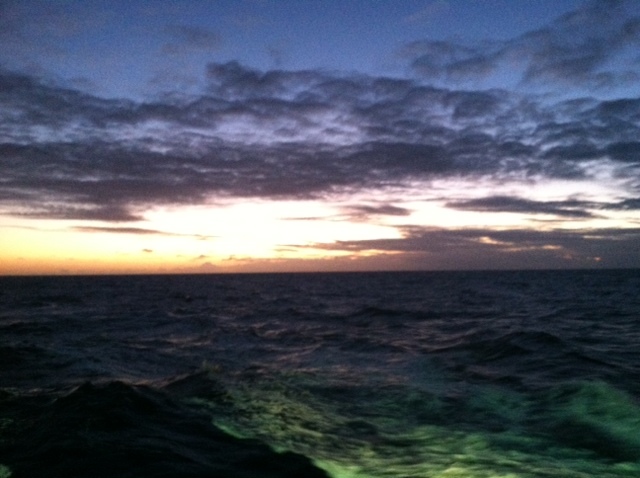 At sunset we tracked down the array and hauled it back on deck. 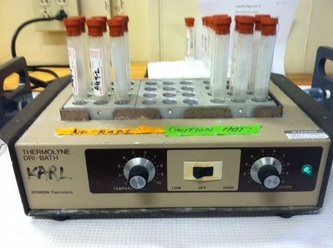 The samples were then analyzed to determine the rate of CO2 uptake (primary productivity) using the 14C label and also the rate of protein synthesis /bacterial productivity using the tritiated leucine label. Recovery of the productivity array. Heading north and looking back at the North Shore of Oahu. 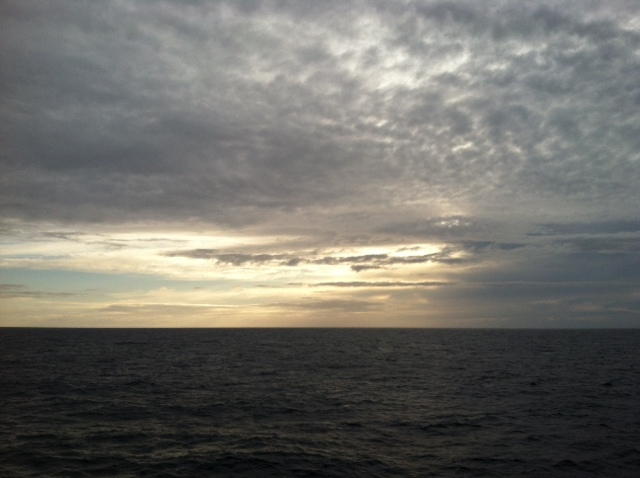 First pacific sunset on the R/V Kilo Moana.